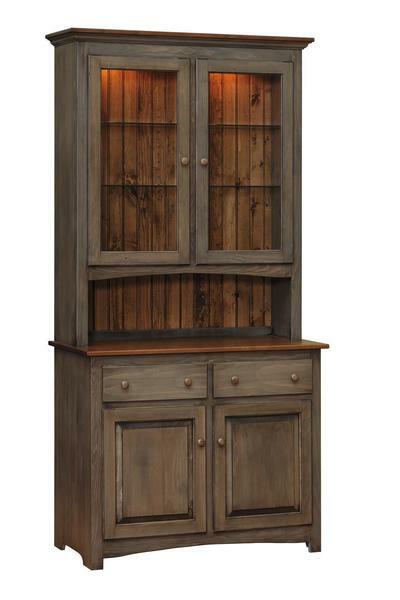 Our stunning Capri Shaker Style Dining Hutch brings a country chic look into today's modern lifestyles and homes. Built from solid Eastern White Pine Wood, this handcrafted hutch has an ideal surface for applying a custom stain or paint finish to fit your personal style. This beautiful Capri Hutch and the rest of our Pine wood products from The Heritage Pine Collection is available with a variety of eye catching finish options including standard stains, premium paints, two-tone finishes, and an additional glaze option that adds a black glaze over your chosen finish creating an antique look that is exclusive to these Amish handcrafted pine wood products. Shop DutchCrafters Amish furniture store in Sarasota near Pinecraft or online from the comfort of your home. We offer a wide variety of rustic pine wood furniture as well as cottage style furniture. All of our pine wood furniture can be customized. I wanted to thank you so much for the beautiful Amish hutch you built for me. It’s one of the most beautiful and well made pieces I have ever had. It was wrapped and packaged so well it took us awhile to unwrap it so I could take a look. We will be moving later this year and building a new house. This hutch will be one of my prized possessions!